WHAT'S INSIDE 3 Museum Updates 4 QPD presents award 5 The Salvation Army 6 Editorial 7 Letters to Editor 8 Restaurants 18 Squares in the Desert 18 Mt. Quail Cafe Featured Artist 20 Around Town 22 Bingo 28 Blood Drive 29 Music in the Desert 29 Music Jams 30 Senior Moments 31 Snakeproof your dog 32 Show Map 32 Quartzsite Crossword Puzzle 37 Sights to see 38 Off Road Atlas 39 BBB Tips 40 Centennial Tree 41 Arrest Report 41 Herb Mama 42 Churches 44 Nancy's Kitchen 44 Show Schedule 45 Classifeds 45 Paul Winer's Cartoon www.DesertMessenger.com • "Quartzsite's FREE Community Paper" • 928-916-4235 WEDNESDAY, January 2, 2019 VOL. 15 # 291 Now in our 1 5 t h YEAR! Alwa y s FREE! 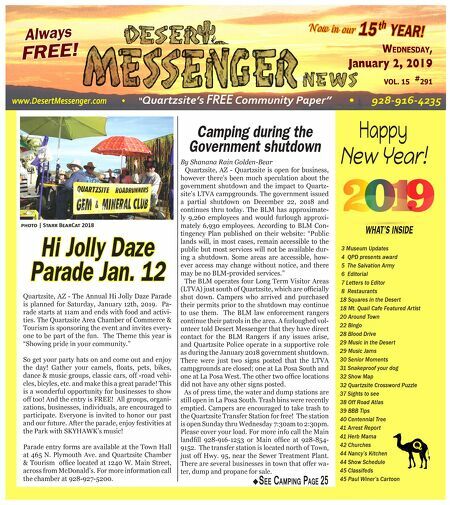 ����� | S���� B���C�� 2018 Camping during the Government shutdown SEE CAMPING PAGE 25 Hi Jolly Daze Parade Jan. 12 Quartzsite, AZ - The Annual Hi Jolly Daze Parade is planned for Saturday, January 12th, 2019. Pa- rade starts at 11am and ends with food and activi- ties. The Quartzsite Area Chamber of Commerce & Tourism is sponsoring the event and invites every- one to be part of the fun. The Theme this year is "Showing pride in your community." So get your party hats on and come out and enjoy the day! Gather your camels, fl oats, pets, bikes, dance & music groups, classic cars, off -road vehi- cles, bicyles, etc. and make this a great parade! This is a wonderful opportunity for businesses to show off too! And the entry is FREE! All groups, organi- zations, businesses, individuals, are encouraged to participate. Everyone is invited to honor our past and our future. After the parade, enjoy festivities at the Park with SKYHAWK's music! Parade entry forms are available at the Town Hall at 465 N. Plymouth Ave. and Quartzsite Chamber & Tourism offi ce located at 1240 W. Main Street, across from McDonald's. For more information call the chamber at 928-927-5200. Happy New Year! WHAT'S INSIDE By Shanana Rain Golden-Bear Quartzsite, AZ - Quartzsite is open for business, however there's been much speculation about the government shutdown and the impact to Quartz- site's LTVA campgrounds. The government issued a partial shutdown on December 22, 2018 and continues thru today. The BLM has approximate- ly 9,260 employees and would furlough approxi- mately 6,930 employees. According to BLM Con- tingency Plan published on their website: "Public lands will, in most cases, remain accessible to the public but most services will not be available dur- ing a shutdown. Some areas are accessible, how- ever access may change without notice, and there may be no BLM-provided services." The BLM operates four Long Term Visitor Areas (LTVA) just south of Quartzsite, which are offi cially shut down. Campers who arrived and purchased their permits prior to the shutdown may continue to use them. The BLM law enforcement rangers continue their patrols in the area. A furloughed vol- unteer told Desert Messenger that they have direct contact for the BLM Rangers if any issues arise, and Quartzsite Police operate in a supportive role as during the January 2018 government shutdown. There were just two signs posted that the LTVA campgrounds are closed; one at La Posa South and one at La Posa West. The other two offi ce locations did not have any other signs posted. As of press time, the water and dump stations are still open in La Posa South. Trash bins were recently emptied. Campers are encouraged to take trash to the Quartzsite Transfer Station for free! The station is open Sunday thru Wednesday 7:30am to 2:30pm. Please cover your load. For more info call the Main landfi ll 928-916-1253 or Main offi ce at 928-854- 9152. The transfer station is located north of Town, just off Hwy. 95, near the Sewer Treatment Plant. There are several businesses in town that offer wa- ter, dump and propane for sale.